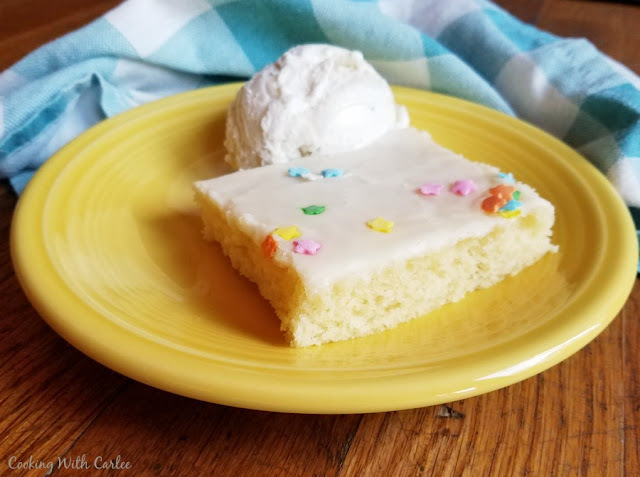 This Lemon Texas Sheet Cake is perfect for feeding a crowd. It is so easy to make and has just the right amount of lemon flavor. Take it to your next BBQ, family reunion or potluck! Did you know that Texas Sheet Cakes can come in other flavors than chocolate? It's true! I know that chocolate is the traditional version everyone knows and loves, but the possibilities don't have to end there. In fact there are a ton of flavors you could make. Now I do have a variety of jelly roll sheet cakes on the blog. There's the Elvis version with banana, peanut butter and bacon. There's the banana with salted caramel cream cheese frosting and both of those are amazing. But MiMi says they are NOT Texas sheet cakes. You see she has rules for what qualifies and what doesn't. In her world, obviously it has to be baked in the half sheet jelly roll pan to feed a Texas sized crowd. You might think that's the qualifier, but the rules according to MiMi don't end there. No sirree! In addition to the size, the batter also has to be made with the boiling water and butter. That is her favorite part of sheet cake recipes, not having to think ahead and letting things soften! 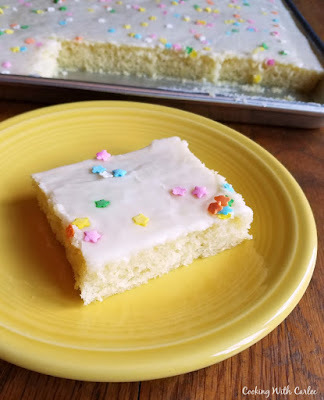 So with that in mind, this lemon sheet cake is a true Texas sheet cake. That is if MiMi is the one that makes the rules. That is why she used that method to make her chocolate chip cookie dough sheet cake, one of her most popular original recipes! Honestly, the ease of putting these cakes together is a big draw. The frosting is just as easy to make. Even better, pouring warm frosting over a warm cake means it practically frosts itself and keeps the cake so moist and delicious. 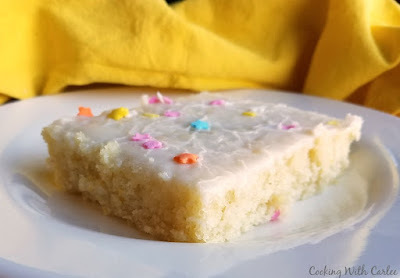 So go ahead and whip yourself up a lemon Texas sheet cake for your next party. Maybe a white Texas sheet cake and a chocolate peanut butter one too while you're at it. I mean they are easy, delicious and fun to share! What are your favorite Texas sheet cake flavors? Or maybe there's a flavor you'd like to see made into a sheet cake? That might be a fun challenge! Grease a 13X18" jelly roll pan and preheat the oven to 350 F.
In a large bowl whisk together flour, baking soda, salt, sugar, sour cream, lemon extract and eggs. Stir until completely combined. Place butter, water, lemon rind, lemon juice in a medium sauce pan. Bring to a boil, stirring occasionally. Add the hot butter mixture to the flour mixture and stir well. Pour into the prepared jelly roll pan. Bake at 350 F for 17-20 minutes or until it tests done. Cool on a wire rack for 20 minutes while you make the icing. Combine the butter, and milk in a sauce pan. Heat over medium heat until the butter is melted and the mixture just starts to boil. Remove from heat and stir in the lemon extract. Gradually add the powdered sugar, stirring the mixture until it reaches a good consistency for spreading. After the cake has cooled for 20 minutes, spread the warm icing on the cake. Let cool completely on a wire rack. This is perfect! You know how much I love my lemon and I would love to make a big pan of this! Have a great day pretty lady! It is so easy too! Maybe you can make it for your house warming when the house is done! Have at it! It has fruit, so it's acceptable for sure! To tell you the truth, a lemon sheetcake sounds better to me than a chocolate sheetcake. This looks sooo good! It really is pretty darn good! Thank you! Hi Carlee, MiMi sounds like a lady who knows what a sheetcake is and no one will argue. For me any lemon or chocolate flavoured cakes will always be enjoyed, and with a frosting to match I'm in 7th heaven.... I won't knock the banana, peanut butter and bacon cake until I've tried it. It does sound interesting! I'm with you, I'm always ready for chocolate or lemon cake. Though I am usually willing to try any cake that makes its way to my plate! I had always wondered what made the "Texas" part of the sheet cake! Thanks for clearing that up! I have to try your recipe. Lemon 3 ways has me so intrigued! Well now you know MiMi's rules anyway! I would never argue, and it works for me! I wondered about Texas sheet cakes before and your Mimi's rules work for me! I really enjoy lemon baked goods and this cake looks delicious! What MiMi says goes! ;-) Thank you! We will love your Lemon Texas Sheet Cake, it looks awesome! Thanks so much for sharing with us at Full Plate Thursday. Hope you have a great week and come back to see us real soon! Thanks so much, Miz Helen! I love Chocolate Texas Sheet Cake and this one looks just as delicious! PINNED-Thanks for sharing at Friday Frenzy this week! 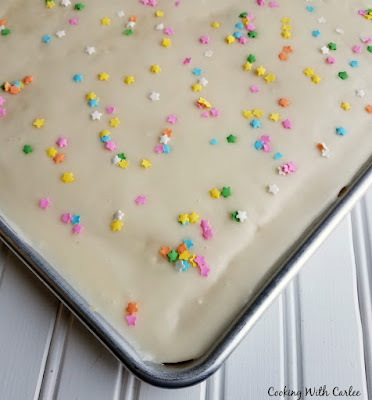 I grew up on chocolate Texas sheet cake and my grandma's house so it is full of fond memories for me, but it is fun to switch it up every once in a while!